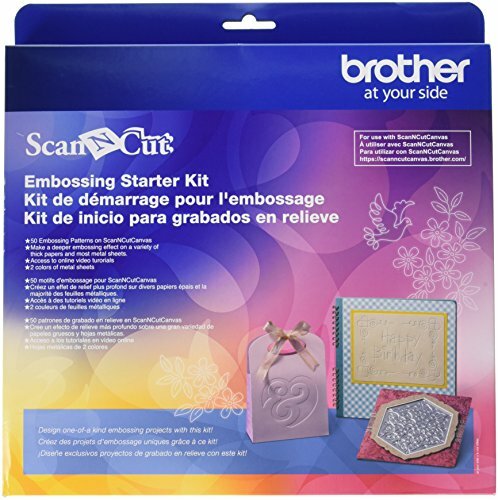 The scanncut embossing starter kit provides all of the materials you need to create an embossing effect on paper and metal. Now, there are so many possibilities to create unique projects with both line embossing and region embossing functions. Kit includes: 1 embossing mat 12" x 9.5" (305mm x 241mm); 1 embossing tool holder; 2 embossing tools (1.5mm & 3mm); 1 silver metal sheet 7.9" x 6.1" (200mm x 155mm); 1 brass metal sheet 7.9" x 6.1" (200mm x 155mm); 1 template sheet 12" X12" (305mm x 305mm); 1 scanning support sheet; activation code for access to 50 embossing patterns on scanncutcanvas; instruction guide.